I received an e-mail from IMHS on the 23rd regarding the hoedown on September 15th. It stated that tickets can be purchased and picked up at the 2nd Chance Thrift Store or the Shelter Office. I went by today, the Thrift Store didn't know anything about the tickets and the main office was closed. Guess I won't be going after all. Shame, it's a really good cause and a fun event. That is a shame ChampagneAbby! Maybe someone will see your post here and help you out? That's what I was hoping DL! I just went snooping on FB and this is in their feed under events with the date and time but there is no information on how much or where to get tickets that I can see. 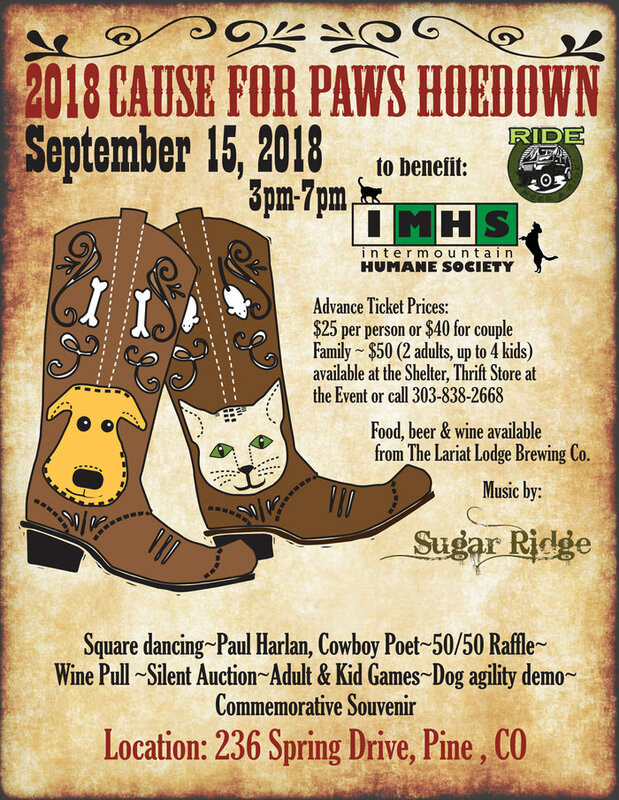 Dancing, games, live music and a Cowboy Poet are just a few of the event highlights on Saturday, September 15, 2018 from 3pm to 7pm. Tickets can be purchased and picked up at the 2nd Chance Thrift Store or the Shelter Office. Thank you Wily - why didn't I think of that? or maybe just call today?